Romulus, My Father is a 2007 Australian drama film directed by Richard Roxburgh. Based on the memoir by Raimond Gaita, the film tells the story of Romulus (Eric Bana) and his wife Christine (Franka Potente), and their struggle in the face of great adversity to raise their son, Raimond (Kodi Smit-McPhee). The film marks the directorial debut for Australian actor Richard Roxburgh. It was commended in the Australian Film Critics Association 2007 Film Awards. The film tells the story of Romulus Gaiţă, a Romanian immigrant to Australia after World War II and his struggle in the face of great adversity to bring up his son, Raimond. As close family members die around him Raimond has to deal with the deterioration of his father's mental health. It is a story of impossible love that ultimately celebrates the unbreakable bond between father and son. Eric Bana as Romulus, the father of Raimond. Kodi Smit-McPhee as Raimond, the son of Romulus and Christine. Raimond Gaita was born in Germany in 1946 and arrived in Australia in 1950 at the age of four. Franka Potente as Christine, the mother of Raimond and the former wife of Romulus. Marton Csokas as Hora, a friend of Romulus. Hora becomes a temporary father figure to a young Raimond Gaita while his father is in a psychiatric hospital. 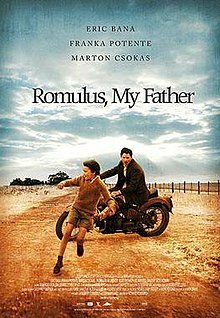 Romulus, My Father grossed $2,589,674 at the box office in Australia. This page was last edited on 9 February 2017, at 06:57 (UTC).